After last week’s hurricane scare, it seems like an extra good time to get out there and celebrate the waning days of summer! 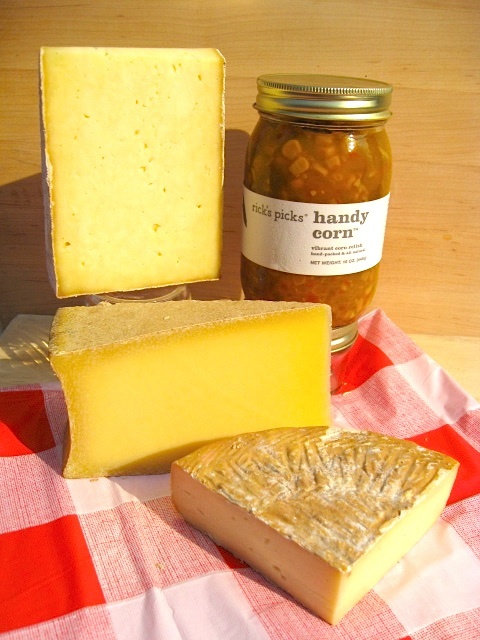 This Labor Day weekend, spice up your picnic with a delicious cheese & pickle pack from Saxelby Cheesemongers. Going out of town? Want to surprise a friend or family member with a yummy, cheesy package? Saxelby Cheesemongers can ship to wherever you’ll be! This Labor Day, we decided to take the corn off the cob and put it into a jar of that vibrant, delicious pickle relish known as Rick’s Picks Handy Corn. Cheese on the Radio! Tune in to Cutting the Curd Mondays from 4:30 to 5:00 on the Heritage Radio Network, or download the show as a podcast. First off, an apology! Last week’s synopsis of Cutting the Curd was woefully incorrect. We had the distinct pleasure of talking with Carlos Yescas, Mexican cheese advocate, consultant, and author of Lactography, a fascinating cheese blog. If you missed last week’s episode, tune in here for a fascinating discussion. This week on Cutting the Curd, we chatted with Brian Keyser, owner of Casellula Cheese and Wine Cafe, as well as the recently opened Elsewhere. Brian, along with Dimitri Saad, fromager in chief at Casellula talked to us about their incredible cheese program. Listen in and discover two of NY’s most fabulous cheese-centric restaurants!